National Hummus Day you say? It is indeed National Hummus Day and I’ll be on Portland’s ABC’S KATU CH 2 AM Northwest this morning at 9-10am sharing this super delicious and healthier way to Hummus Dressing Pasta Salad! Hummus is the best way to make pasta healthier, adding protein, swapping mayo and adding nutrition. It’s also a great way to a vegan pasta, keeping it vegetarian, and over all super good! Over the years I’ve made tons of dishes incorporating hummus into food, and not just as a dip. Which I may add, I eat Sabra Hummus as a dip, and snack a lot. Hummus is so filling, full of protein which is good for us. Have you tried making dishes with hummus? I’d love to hear what you made! #HummusDay is the hashtag we’ll be using if you want to follow along with all of the amazing bloggers sharing tasty recipes all over the internet and find different ways to use Hummus! 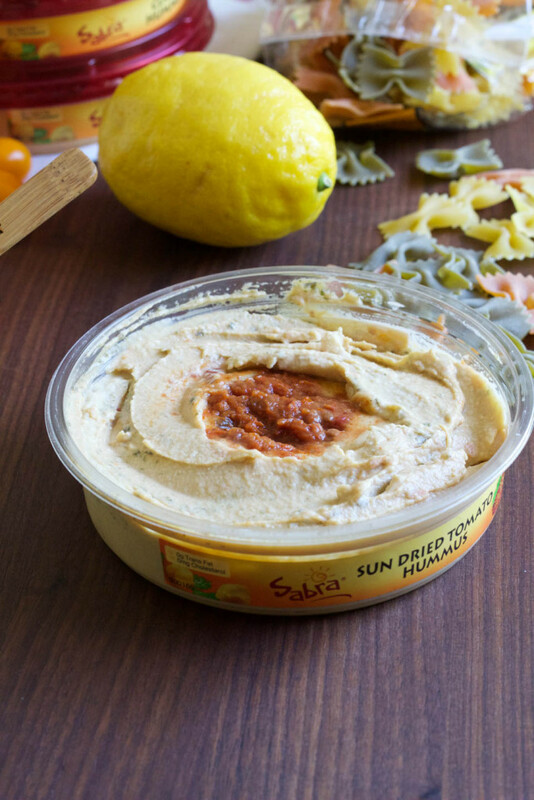 On May 21st, Sabra will be giving away coupons to celebrate National Hummus Day! Click here for your coupon. Go print it today, it is only available on May 21st. 1. Cook the pasta according to the package. Remove the cooked pasta by using a slotted spoon or spider. Blanch the snap peas by placing in the boiling water (after removing the pasta) for 2-3 minute, or until bright green. Remove and place in a large bowl filled with ice and water, using a slotted spoon or spider. 2. Place hummus, olive oil, and lemon in a medium bowl, whisk to combine until smooth. Pour over the warm pasta, mix to combine using a spatula. Add blanched peas, radishes, tomatoes, and parsley. Stir to combine. Taste for seasoning, add salt and pepper if needed. I did not add any. Serve cold or at room temperature. Best at room temperature. Store leftovers in an airtight container for up to 5 days. Dishes I’ve made with Sabra Hummus! Dishes my blogging friends made with Sabra Hummus! What a healthy alternative to mayo dressing on pasta salad. And fun! What a great way to make a dressing! I pretty much love it on everything! 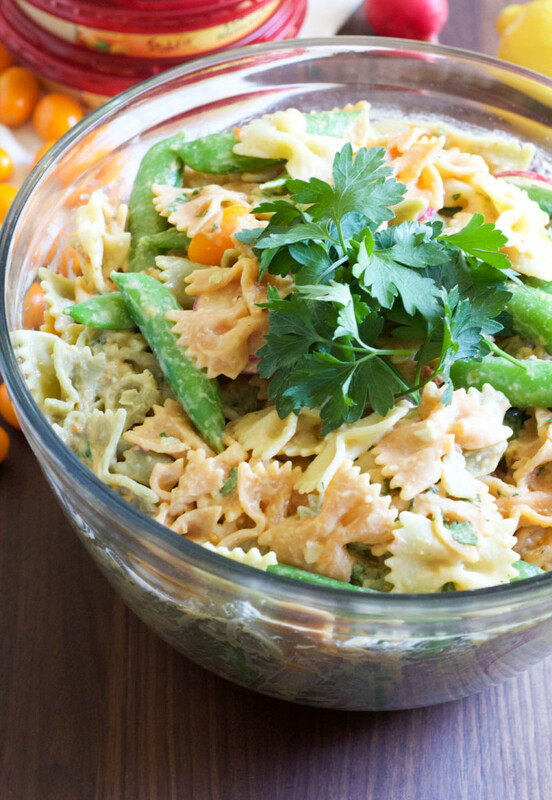 I love the idea of using hummus to dress pasta salad! So unique, healthy and delicious! Thank you, Faith! It’s my favorite. What a great idea for a pasta salad! I am so trying this! Thanks for including my Sabra recipes! Happy hummus day! My pleasure! Thank you so much. What a delicious & inventive idea! 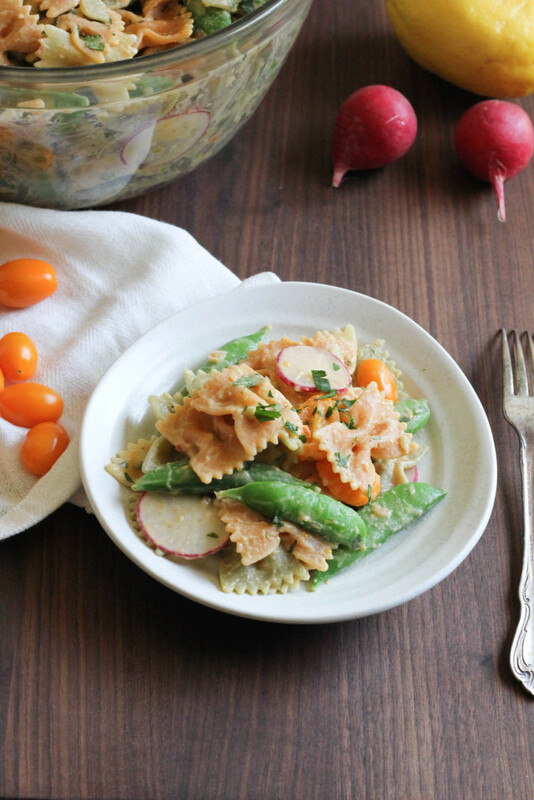 I am so all about this creamy, healthy pasta!! Me toooo! Thank you dear. I love using hummus for salad dressing! It’s such a good way to add extra nutrients! Can’t wait to try in a pasta salad. Thank you for sharing too! Yes, way better pasta salad dressing than most. Love hummus but haven’t tried it as a salad dressing yet. I need to try this recipe this summer! You’ll love it! Healthy and easy. Thank you! I LOVE the idea of turning yummy sabra hummus into a dressing! Beyond fabulous! Thanks for featuring my hummus peppers too! <3 And good luck today! Thank you thank you sweets! It was awesome! I love this healthy twist, with added protein from the hummus. 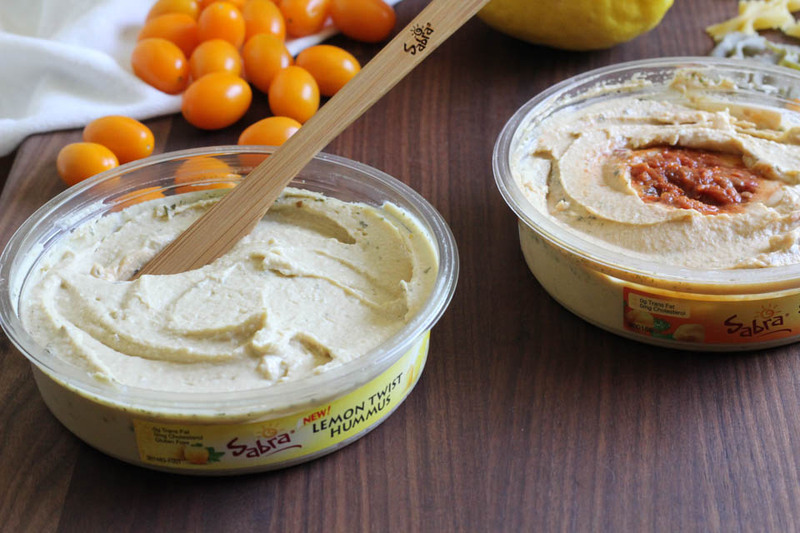 I know Sabra has so many good flavors, but their new lemon one has me intrigued! Thank you!!! Yes, the lemon is to die for. So much better than mayo pasta salads for sure. Love that we both used the hummus to make dressings! Happy Hummus Day! This looks terrific. HA, great minds obviously! Isn’t it the best. I love hummus dressing. Yours looks amazing too! 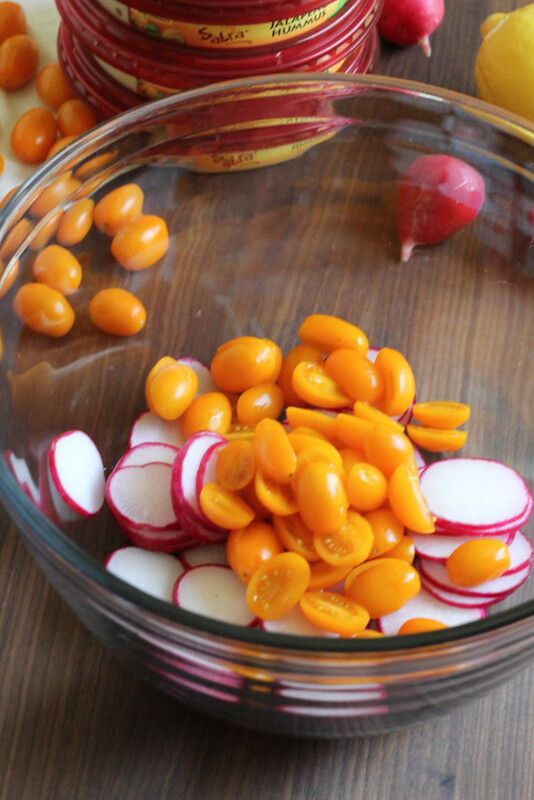 this looks SO good – I love to use hummus as a salad dressing, but never thought of this! happening soon, thanks Fabi! Thank you so much! Yes, I love using it with pasta, it’s probably my favorite way to hummus. The Lemon is sooooo good!